ELEVATION: 4170 Ft, 3950 Ft, 3905 Ft.
From Berlin take Route 110 northwest to Mill Brook Rd (Forest Road 11) 3.7 miles to the berlin Fish Hatchery gate. The gate is typically open (and employees will typically leave the gate open after hours if they see a car in the hiker parking lot). If you are concerned about getting locked in, you can park here and walk 0.8 miles from the gate to the Unknown Pond Trailhead. DESCRIPTION: The trails above are the primary route to access Mt. Cabot, The Bulge, and The Horn due to private property concerns and the AMC request to avoid the Mt. Cabot Trail several years ago. The Unknown Pond trail exits the back of the parking lot and un-blazed, overgrown mud-pit in desperate need of trail maintenance. 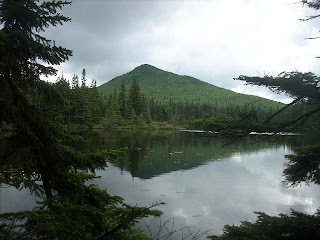 Over the 3.3 miles the trail gradually inclines through birch glades and large ferns as it travels towards Unknown Pond paralleling a small brook. The gradual trail steepens and continues its grade as it continues the ascent to Unknown Pond. You follow the eastern perimeter of Unknown Pond to the Kilkenny Trail junction at 3.3 miles. The Kilkenny Trail bears left and gradually ascends through fir trees as you continue around Unknown Pond. It then begins it's 1.7 mile ascent to the col between The Horn and The Bulge. Older AMC (and Topo) maps show the Kilkenny trail ascending over The Horn however the trail has been rerouted and ascends into the col between the two peaks. The Horn is a short and steep .25 mile pitch to the left. Views from the Horn are extremely impressive. Descend back to the saddle and follow the Kilkenny trail over the viewless Bulge as you travel 0.85 miles to the 4170 Ft. Mt. Cabot. The viewless Mt. Cabot summit is marked with a sign. Return the way you came. At 4170 Ft. Mt. 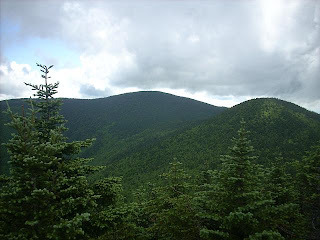 Cabot is on the AMC list of New Hampshire mountains above 4000 Ft. 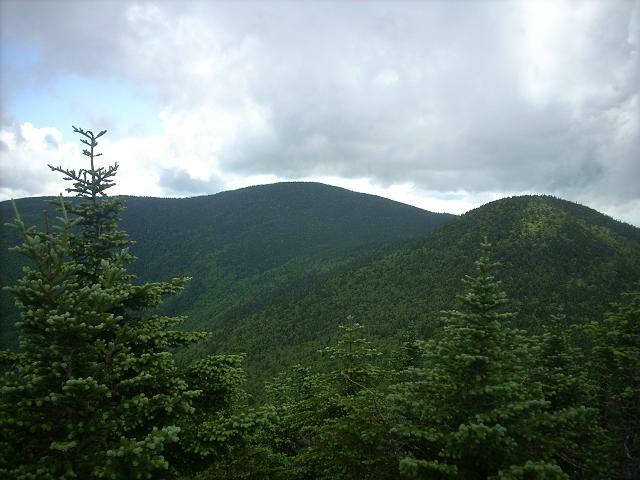 The Bulge and The Horn are both on the AMC list of 100 highest peaks in New England. As you progress around the Eastern perimeter of Unknown Pond there will be an occasional excellent view of The Horn reflecting off the water surface to the West. There is a benchmark on The Horn's summit. The AMC guide (28th edition) and most on-line topo maps show the Kilkenny trail ascending over the Horn. I made the assumption it did, which added some confusion as I hiked around the Horn to the saddle. Views from The Horn are spectacular and the best of this trip. Both The Bulge and Mt. Cabot have wooded summits.